High end components and uncompromising quality in manufacture means you can shoot downrange more consistently and expect excellent penetration, projectile weight retention and consistent accuracy. The reloadable brass cartridge casing paired with a Nosler bonded polymer tip allows you extreme confidence in the reliability and terminal ballistics of the load. A moderate 180 load is a good general weight for a variety of needs. The premium projectile ensures that the bullet retains its weight on impact and has controlled deformation. The load is suitable for medium and large game (Deer, elk, or similarly sized targets) or for other precision shooting needs. It offers a reliable feeding round for all firearms with the polymer tip and the newly manufactured brass casing. The velocity is 2550 and the energy is 2598 at the muzzle. 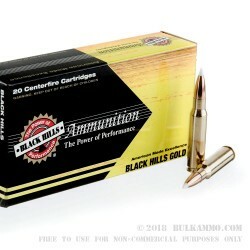 Black hills ammunition is known for its consistency and quality in manufacturing. Boxer primed, and a brass casing make this cartridge easily reloadable. This is a box of 20 cartridges packaged in a standard cardboard box with an insert. 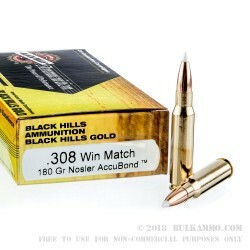 Black Hills ammunition is a standard for law enforcement and military for precision shooting needs. 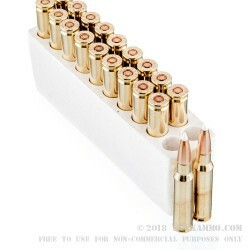 The company has a long history of providing consistently high-quality ammunition to shooters of all types. 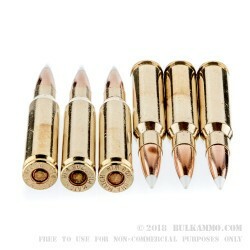 This ammunition is safe to shoot in all modern firearms marked as “.308”, “308 Winchester” or “7.62x51”; it is loaded to SAAMI specifications.